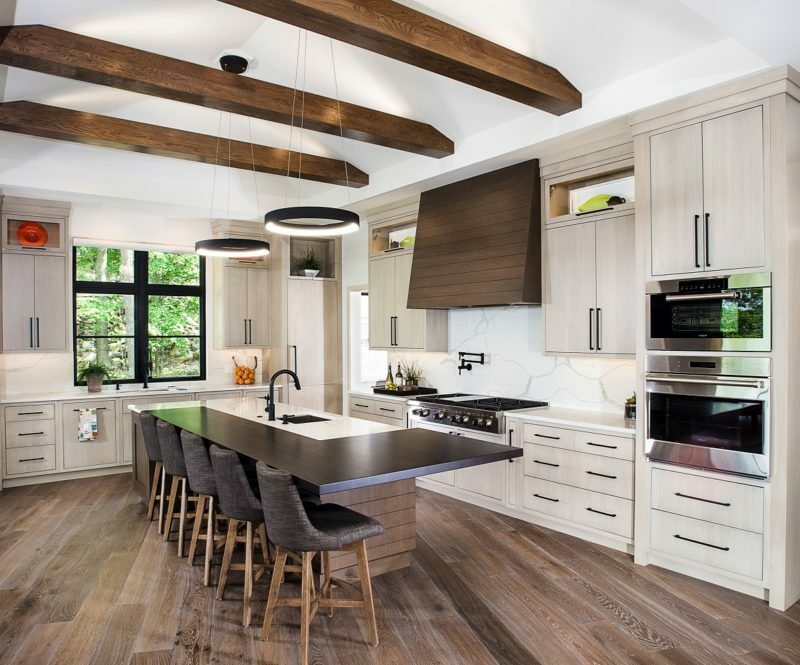 Architects, builders, and interior designers are encouraging homeowners to consider how they will age in their home when looking at new construction and remodels. Certainly, no one can predict the future, but as one of your biggest investments, your home should have the ability to grow with you through life’s transitions, whatever those may be. Whether you’re about to launch into the great adventure that is planning and building a new home or considering renovations to your current home, there are several considerations to make aging in place a seamless transition. The home exterior is one of the most important considerations. It should be low maintenance; using elements such as fiber cement siding, stone, or brick will provide years of carefree or minimal upkeep. Building a covered, zero-step entry will provide protection and firm footing in Michigan’s ever-changing weather and allow wheelchairs a hassle-free pathway. To make an existing home more wheelchair accessible, hire an architect or designer to devise a ramp that suits your needs. It should have a gentle slope, plenty of turning room, and handrails on each side. In the foyer, seating with space for packages or groceries can keep belongings accessible without undue lifting or strain. The kitchen is the heart of every home and requires attention to detail to ensure that everything is easily accessible and safe. Since the sink is the kitchen workhorse, several modifications can keep it fully functional for every family member. Adjusting its height and designing a roll-under sink with a pull-out spray faucet makes it fully functional for the wheelchair-bound to use without strain. Adding pull-out and pull-down shelves in cabinets and using drawers instead of doors can reduce reaching, bending, and back strain. Drawers that are at least 30-inches deep allow for plenty of storage for pots and pans and displays them for easy availability. Cabinets and drawers should be outfitted with D-shaped handles or pulls to make it easier on the hands. Relocating the microwave to a lower cabinet minimizes lifting heavy cookware above your head. The overall floorplan should allow 42-to 48-inches around islands or tables for functional maneuverability. At least one main-level full bathroom is crucial for anyone with mobility or balance challenges. A talented designer or architect can create a calming refuge where anyone can escape and indulge in self-care that relieves aches, pains, and stress and improves sleep. The Centers for Disease Control reports that two-thirds of bathroom injuries happen near a tub or shower. A roll-in shower or walk-in bathtub with grab bars and anti-slip surfaces and flooring minimizes potential hazards. Adding easy-to-reach adjustable controls and a shower seat will make this space restful and suitable for all needs. For plenty of space to maneuver in the bathroom, the layout needs to allow at least a 60-inch diameter turn space. Exterior and interior lighting should never be an afterthought in a home, and it is especially important to maintain a functional and safe environment for those with reduced vision. Switches need to be at an accessible height, and rocker switches can be easier to operate. Installing additional task lighting in low-light areas under cabinets, in closets, or beside the bed is advisable. Incorporating lights on all stairways helps with impaired depth perception, reducing the risk of falling and making it easier to move between floors. As stairs can present significant challenges for those with reduced strength in their legs or balance issues, a chairlift or elevator should be considered. Although chairlifts are a more cost-effective way of adapting stairs, an elevator will add resale value to the home. A designer or architect can anticipate this future addition by stacking closets measuring at least six feet by six feet to form a potential elevator shaft. There is minimal cost to prep for this during construction, and the space can be converted into an elevator in a weekend’s time. Another subtle factor that can make a home appear streamlined and elegant is to use pocket doors. By code, a 32-inch clear opening is required for all doorways, and a pocket door can be a true 32-inch width since it needn’t accommodate a protruding hinged door. Not only is this proportionally more pleasing to the eye, but someone with mobility challenges isn’t always fighting to open, close, or move around a door. Hardware considerations like lever handles rather than knobs also ease passage through a home. An open floorplan limiting hallways is desirable, and flooring should be hardwood, tile, or laminate with a nonslip finish throughout the home. Consider casement-style windows rather than double-hung. An intercom system keeps residents in touch with each other, and an electronic environmental home control system keeps technology at your fingertips. There is a comfort to being prepared for whatever life can hand you, because the best is yet to be. Making an appointment now with an architect or home designer who is aware of these issues and creating a plan to age in whatever place you desire will make any future transition seamless.